I'm running around New York today trying to get a million things sorted out. 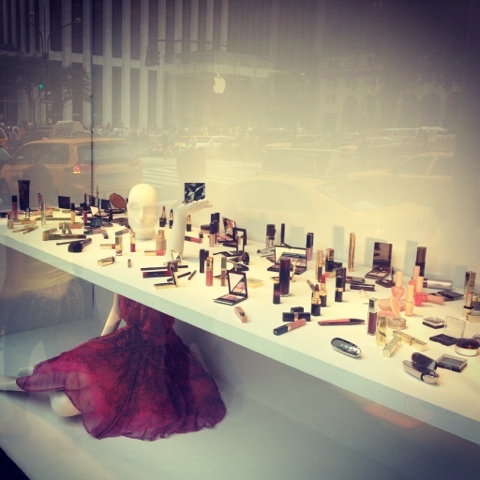 In the meantime, let's play Spot the Beauty Brands with this Bergdorf's display window. Most correct guesses get a virtual lipstick and actual bragging rights! PS: I am now on Instagram as "messywands"! Is it just one brand or multiple brands in the window? Because I clearly see Guerlain packaging, but I'm not sure if I should be looking for other brands :) I think I see Chanel, as well. CHANEL, GUERLAIN, KEVYN AUCOIN, YSL, PAUL&JOE, SUNDAY RILEY, LAURA MERCIER....OH MY GOD, I WISH I COULD DISPLAY MY MAKEUP LIKE THIS AT HOME! Drool! Can I just have it all, please?! I definitely spot some Guerlain, Chanel, Cle de Peau, YSL and Paul & JOe. uhh lol I can't stop staring at the mannequin. Is there a special hole in the table for her head? I spy the Guerlain lipsticks, some Chanel, YSL, and I'm going to stop now before I go blind squinting at this thing. nice post, thanks for writing!!! rebecca- it's a multitude of brands! Little*- I wish too, albeit somewhat impractical. I guess you get the virtual lipstick as well! Morzelz- I'm sure they lopped off her head and placed it on the table. Seems easier! I see... Guerlain, Chanel, Paul and Joe, Hourglass, NARS, YSL... That looks like a Laura Mercier powder... and its a longshot, but it looks like a couple of Butter London nail polishes in the back corner. I think that mannequin is a symbol for us crazy people. Ok, I'm going to try to give this a shot!! Lots of Guerlain, lots of Chanel, lots of YSL, several Sunday Riley, Several Paul & Joe, Estee Lauder, Laura Mercier, Kevyn Aucoin, LMdB, Chantecaille, Tom Ford, Bobbi Brown, thought I saw a Lipstick Queen Lip gloss (but i don't think they sell LQ-so it's probably something else), Clarins, Trish McEvoy, Kanebo (pause, I look like an idiot I'm so close to my monitor that it's ridiculous), and Edward Bess. There's more, but it's too hard to see. The reflection of the NYC traffic and MAC store is spectacular!! xiao, you are so lovely to say that. I looked like a COMPLETE crazy person as I had literally climbed on top of my desk and got as close to my monitor as possible- turning my head side to side! Oh, for the love of makeup-- the things that we will do. That we are all so capable of identifying the packaging is pretty hilarious-- we beauty bloggers and beauty obsessed have some pretty interesting skill sets!! LOL!